THE ONE AND ONLY, THE FIRST OF MANY. ONLY 160 TICKETS AVAILABLE – TICKETS CAN BE BOUGHT ON TICKET HOTLINE – 0847684955 – WITH FREE DELIVERY! 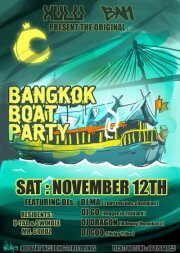 XULU PRESENTS and BN1 team up to bring you a Bangkok’s only party cruise!! surely spectacular night on the water, cruising up and down the Chao Praya river past Bangkok’s ancient temples, modern sky scrappers and under massive bridges, where the sounds of over 200 party people will echo over the air. Our finest MC’s and DJ’s will serve up the latest in cutting edge underground tunes to keep the boat a’rockin till we dock with CHEAP DRINKS ALL NIGHT! The Upper Deck: Reggae, Electro-Breaks, Dubstep and DnB. Prize give away and contests throughout the party!!! The boat is large, safe, and spacious with plenty of clean bathrooms and air conditioning in the lower deck. Lazers, lights and a moving roof over our heads in case of a bit of rain. We have a professional crew and security team so no one goes overboard, but trouble makers will have to walk the plank.